Simply get a bottle of this delicious Japanese sesame sauce at Japanese products shelf in major supermarkets. 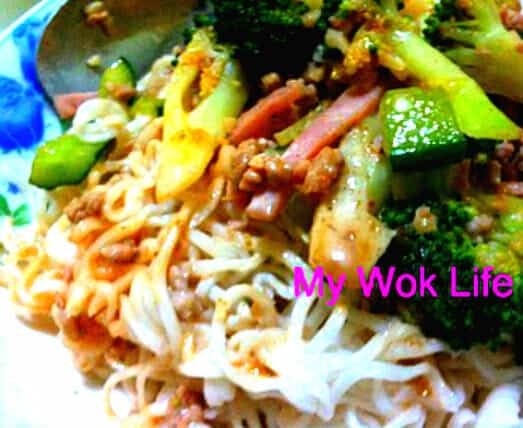 This noodles dish can be prepared in a flash! 1) Bring a pot of water to a boil. Add noodles to cook till soften, for 3 minutes. Remove from pot, and quickly plunge the cooked noodles into the iced water for 5 seconds. Then, transfer it back to the hot water and plunge for 5 seconds. Remove and drain. Place noodles into a large bowl, add olive oil and mix well to avoid sticking. Divide noodles into plates. Set aside. 2) In a separate pot, bring water to a boil. Add some sugar and blanch broccoli for 2 minutes. Remove and drain. In a wok/ large saucepan, heat oil over high fire. Add garlic and sauté till fragrant. Then, add in seasoned minced meat and ham, stir fry for 2 minutes. Add in the blanched broccoli and cucumber, continue to stir fry for 2 minutes. Sprinkle salt and pepper to taste. Stir fry to combine well. Heat off. Dish up and top it on the noodles. 3) Finally, top Japanese sesame sauce and sprinkle some toasted sesame. Serve warm. This Japanese sesame sauce tastes so pleasant and fragrant, leaving the aroma of sesame in the palate after taste. Add more sesame sauce to intensify the flavour of the noodle dish, if desired. Toss the noodle and toppings before digging in! A portion of my quick sesame sauce noodles counts about 380kcal. Calorie intake varies with the modification of toppings. Variations: Use chicken fillet strips or prawns with carrots or asparagus over my listed toppings. Choice of noodles can be varied, too. Use soba noodle, if desired. 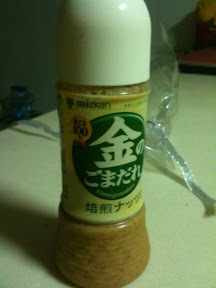 Tips: A bottle of this Japanese sesame sauce costs about S$7-8 and available at major supermarkets. It comes in original and garlic flavours, for your consideration. This instant sesame sauce is also great to use as green salad dressing, or as dipping sauce for fried tofu dish, prawn fritters or chicken nuggets. * As for the white sesame for garnishing use, toast sesame in oven at 150°C or sauté on stove over low heat, for 3 – 5 minutes.